We created a cocktail recipe with both the ladies and gents in mind for the 4th of July picnic. Hopefully it’s a 3-day weekend for everyone! Our patriotic rum cocktail recipe tastes perfectly of spiced rum and cherry-citrus sweetness. The key to this recipe is to ensure the brown sugar dissolves completely, so make sure the rum is a little warm or at room temperature as you combine the two ingredients. Don’t worry about getting the mixture chilled—the magic will happen in the cocktail shaker! For extra pizzazz, top this patriotic rum cocktail recipe with maraschino cherries and a fresh wedge of orange. If tangelos are available at the local supermarket—they’re definitely in season during the summer—try those instead! They’re gorgeous and are great to snack on while you’re sipping. Combine rum and brown sugar in a cocktail shaker then stir until brown sugar has dissolved completely. Pour remaining liquid ingredients into shaker then add ice. Shake or stir vigorously then strain into prepared glasses with fresh ice. 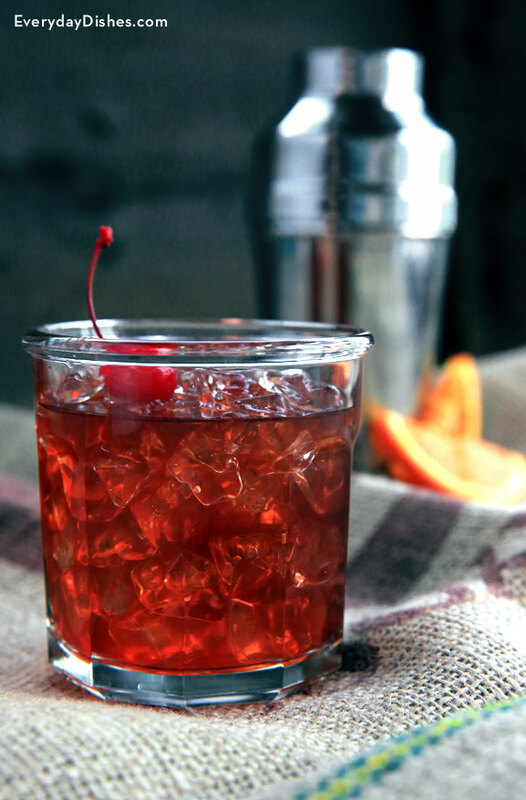 Garnish with maraschino cherries and a fresh wedge of orange. Looking for a lighter version of this drink? Switch the spiced rum for light rum or add a splash of club soda to curb the sweet flavor.